British actor Gwilym Lee has built a notable body of work in film, television, and theatre in his career. With several exciting projects coming up, the next few months promise to firmly establish him as an international acting presence to watch. Gwilym stars in Twentieth Century Fox’s highly anticipated Queen Biopic Bohemian Rhapsody. The film chronicles the years leading up to their legendary appearance at the Live Aid concert in 1985, and Gwilym takes on the role of guitarist Brian May, alongside Rami Malek, Joseph Mazzello and Ben Hardy who form the rest of the band. 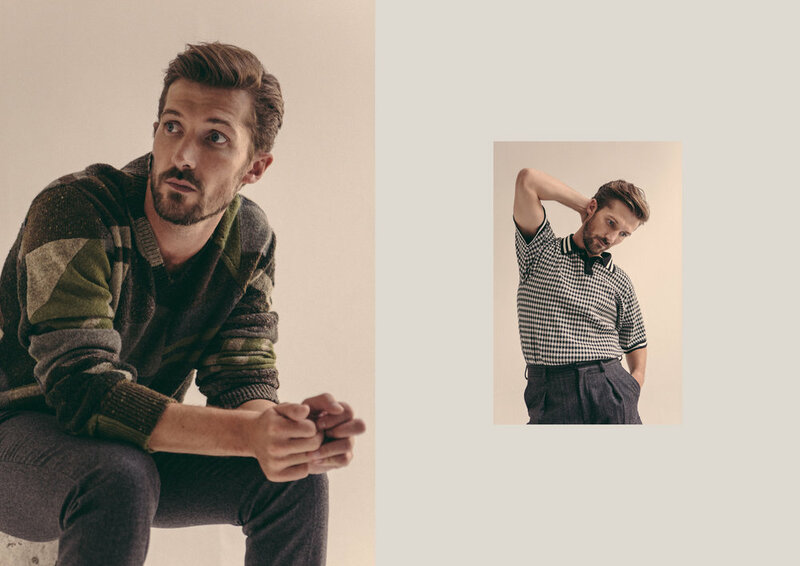 We spoke with Gwilym on this exciting new project, his career in general, and the relationship between an actor and his roles. Gwilym wears all looks by Stella McCartney. Elena Stanciu: Your career is on an impressive track forward. What aspect of your professional life are you most proud of? Gwilym Lee: I suppose there are numerous significant moments I look back on in my career so far. The first was probably being accepted into drama school with a scholarship; it felt like the beginning of something. I went on to graduate and win the Guildhall School of Drama Gold Medal, which was another proud moment. To be honest, acting is such a tough industry that I’m immensely proud of every job I’ve done. Each job feels like a small miracle. But the jobs that really stand out would be my first job out of drama school, which was to play the messenger and to understudy Ralph Fiennes in Oedipus on the Olivier Stage at the National Theatre – it was a stage I’d always dreamed of working on. A couple of years later I played Edgar in Sir Derek Jacobi’s King Lear. All of us in that cast felt like we were part of a very special production – Derek was incredible and I felt like I had to raise my game in his presence. I was honoured to receive the Ian Charleson Award for that performance. I started to focus more and more on television and film work slightly later in my career, having had a good grounding in theatre – and to have reached the point of playing a leading role in a big film like Bohemian Rhapsody is a big moment for me. I’m incredibly proud to be a part of telling this story and to be a small part of Queen’s legacy. More generally, I’m so proud to have had such a varied career on stage and screen, and to have worked with so many incredibly talented actors, directors, writers, producers, and creatives. Long may it continue! ES: You mention your work both on stage and on screen; which one is closest to your heart? GL: Both have their pros and cons. Theatre is such a pure, direct medium; you live the arc of the character from beginning to end each night. I love the luxury of long rehearsals to really investigate a story, and I enjoy the transient nature of a live performance, which will never be quite the same from night to night; it becomes alive in front of an audience. The energy I feel from the audience is incredible. Screen work is more disjointed, but I love the atmosphere of a film set – there is something thrilling about it. I love its collaborative nature – the acting department is such a small part of the whole picture. There are so many talented people across countless departments all working towards telling a story. I like the anticipation of waiting to see the final product and the excitement when I finally do. I couldn’t choose between one or the other. The beauty of our job is that we are constantly looking for the next challenge, and that variety is what keeps me hungry and interested. ES: What can you tell us about your role in the upcoming Queen biopic, Bohemian Rhapsody. What were the challenges and joys of portraying Brian May? GL: I play one of the greatest guitarists of all time in one of the most loved bands of all time, so the pressure to live up to that and try and do justice to the legacy of the man and the music is daunting. But that pressure certainly focuses the mind and motivates us to work hard. One of the biggest challenges for me was playing the guitar. I played a little bit of acoustic before, but nothing to the virtuosic lead guitar mastery of Brian May – so I practised every available waking hour of the day to emulate the man. As much as playing this part was a challenge, though, it was immeasurably far much more of a privilege. There were times when I’d be on set, re-enacting Queen’s historic Live Aid performance, or their iconic Bohemian Rhapsody music video, for instance, where I had to pinch myself to see if it’s all really happening. I had always admired Queen and Brian May growing up and one of the greatest privileges of all has been to meet and get to know the man that I play. He is one of the most generous, intelligent and kind human beings I’ve ever had the pleasure of meeting. ES: Is Bohemian Rhapsody a movie we need today, given our political and cultural context? GL: Absolutely! We live in disparate times, when so many people are in opposition with each other. Queen were so universal, so irreverent and celebratory. They really had the ability to bring people together, to give a voice to people who might feel like outsiders or outcasts, and to celebrate life and individuality. Live Aid was one of the last times that the global community came together and bonded through the power of music. It’s no fluke that Queen dominated that day, because they knew how to speak to everyone, whilst making it feel like they’re speaking to you individually. That was the super human talent of Freddie Mercury. They also knew how to have a good time and not take life too seriously – and we could all do with a bit of that sometimes, too. ES: You	graduated from The Guildhall School of Music and Drama. Do you feel that you are still learning during the work you do? What´s the most important lesson you’ve had? GL: I’m constantly learning. It’s one of the defining parts of our job and probably the most rewarding. You have to approach your work with a childlike curiosity and a hunger to learn. Every role has different demands and one of my favourite parts of the job is researching and learning the new skills needed for that role. There have been so many lessons I’ve learned along the way. One of the most important, I think, is to always take work seriously, but never take yourself too seriously. It can be a stressful and uncertain career, so it’s important to live in the present and enjoy the work as much as possible when you have it. I also think it’s important to constantly challenge yourself so as not to lose the sense of curiosity you need as an actor. ES: I often see incredible performances from very talented actors portraying terrible human beings, and I find myself asking: how do they feel about this role? How can they go through these horrible scenes? Of course, these roles are necessary in order to tell important stories. Do you have any roles that you don´t love but feel were necessary to the story? Should an actor always love their role/the movie or play? GL: It’s our duty as actors to find the truth in any character in any situation. That can sometimes be disturbing, but it’s a necessity in order to tell a particular story. We don’t have to love the characters we play, but we always have to find their logic and their humanity, even if it might feel like they don’t have any. We have to represent them and do their stories justice. I’ve played roles that have been disturbing and difficult, but I think the best way to deal with those characters is to be able to walk away from them when you are done. And the best way for me to do that is to have a firm base of family and friends who are a constant in my life and allow me to be myself and disconnect from the work when I need to. ES: Is there a role you would go back and approach differently? GL: I don’t know. I would probably say no, not because I think I have perfected all the roles I’ve played. Not by any means; I would always try and learn from any mistakes I have made. But I feel like I’m a bit of a nomad being an actor – I immerse myself fully in each experience, but then I move on. And I think it’s important to let go once something is finished. ES: Who would direct the lead role of your dreams? GL: Paul Thomas Anderson. He’s a master and it would be a dream to work with him.